We welcome opportunities to partner with you to add learning experiences that your organization desires, and will work out agreements for development costs. 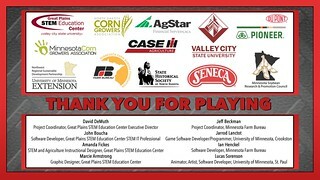 We look forward to partnering with you on projects involving museum display development; informal learning experiences; lesson plans or classroom activities; hands-on interactive labs; software including computer games, apps, websites, or more; or any other agricultural education learning experience you would like to see! Your organization will be listed as an AgInspire Partner for one year at the appropriate contribution level on Our Partners page. We will display any signage you would like to provide for the event, and will add your logo to our partners signage for the event. We charge $500 as a consulting fee to cover our time identifying sponsors for events. If you contact us regarding sponsoring an event, or work with the event directly to sponsor an exhibit, we will waive this fee. Additional, if you fund multiple events in one agreement, we will charge the fee only once. 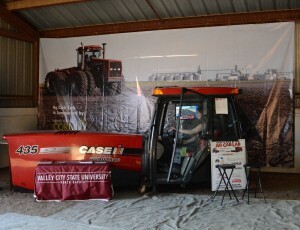 We will also create a farm scene backdrop similar to the one shown here with your organization’s logo. This will be displayed as a backdrop at this an all future AgInspire exhibits sponsored by your organization. You may provide a photo or we will provide one. 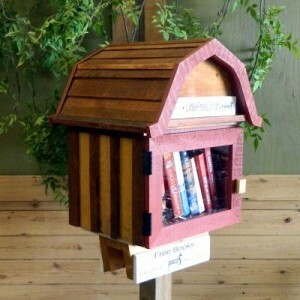 We will also provide a Little Free Library “Book Barn” with your logo and include twenty or more agricultural-approved books. You may choose either the elementary age option or middle/high school age option. You choose where to locate the library or may donate it to a local youth agriculture or educational organization to provide leadership and outreach opportunities for their group. A school or public library would be another great recipient. 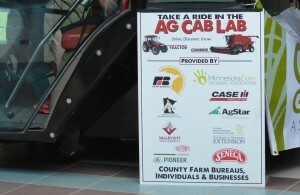 Your organization’s logo will be added to the Ag Cab Lab and Ethanol Racer game software logo displays for one year at the appropriate contribution level. Your organization’s logo will be displayed on signage at all events for one year as a Ag Inspire partner. Please contact us for more information regarding sponsorship opportunities.